February's Visiting Teaching Gift is one of our favorites so far! 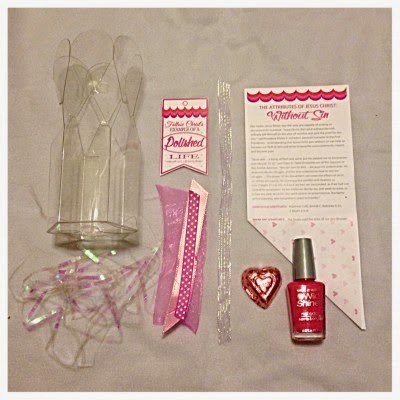 We've styled a darling gift for your sisters; a clear plastic petal container is filled with iridescent grass, the message rolled up, a chocolate heart, and a bottle of finger nail polish. The title of the message from the Ensign is "The Attributes of Jesus Christ: Without Sin." We've focused on how we should try and follow his example, so our tag says, "Follow Christ's example of a POLISHED life." Chocolate and polish will vary. The message is in full color, and we've taken the extra time to make it a gift you will be proud to give! For February's Home Teaching message: Who doesn't want some additional love in their home? 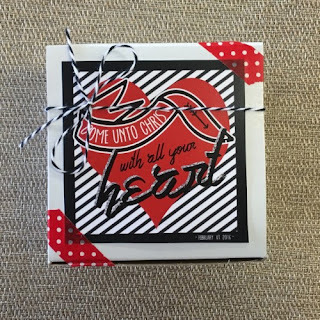 This month's message is centered around how we can achieve a change in our hearts, and our message includes Valentine flavors of salt water taffy! Sounds like the perfect way to spread the love to your Home Teaching Families this month.